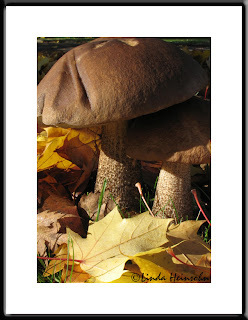 Leccinum Scabrum, or Birch Bolete, popped up in our yard after the first heavy leaf and rain fall. These are edible mushrooms, though no one we talked to at Oregon Mycological Society was wild enough about them to inspire us to cook and eat them. We have maple trees in our parking strip which are not mycorrhizal. Near as we can figure, these mushrooms are associated with the root structure of the old birch trees in the parking strip down the street from us.